Africa is the Most Neglected Ground on this Earth for myriad Reasons. This Blog is maintained by ybrao-a-donkey who is an Atheist and a Modified Marxist. Question: Why are you writing this in your Africa Blog, instead of writing under some blog which may be called 'South America' or 'Venezuela' or 'World Economic Scene'?. Ans: The Problems of Poverty and Deprivation are Universal. The problems of Venezuela or the South America do not be taken as restrictive only to South America or Venezuela. They are very much relevant to Bulk of Africa, Bulk of Asia, and probably even Bulk of Europe. Africa and South America, in World Affairs are like Cinderella(s). That means they have been neglected by the NAEURANZ Heads of State&Governments and their Media. NAEURANZ in all my Blogs refer to: North America, Europe, Australia, New Zealand. Question: Most Marxists and Socialists support Autocracies and Dictatorships run by Despots and Tyrants. You may be one of them. Ans: Nay, not. We cannot support Despots and Tyrants, irrespective of whether they call their Governments as (Hypocritical and Ostensible) Democracies and Socialist/Communist Nations. By all means, we have to despise such Monsters. Now, what is the purpose of your giving the above Spectator Article Link? Ans: We know that in hypocritical Socialist/Marxist/Communist countries, everything monstrous goes on behind Iron Curtains. In the guise of throwing light on what is happening in hypocritical Socialist/Marxist/Communist Monstrous countries, Western Media and Writers take to another type of Propaganda of Misinformation because it suits the needs of their Obnoxious Capitalism and their Multinationals, and their Crony-Capitalist Politicians and Crony-Capitalist-Journalists. Nationalisations, non-stop borrowing, belief in magic money trees: it can all sound like playground patter in British debates. But a strong enough dose of this formula has reduced what was once Latin America’s most prosperous country to penury. The rhetoric, as always with socialism, is aimed at the wealthy. One of the many morals of the Venezuelan tragedy is that it is the poorest, those who do not have bank accounts, who suffer the most when money dies. This Article is written from the Angle of Politics of U.K. British Capitalists, right from their days of East India Company days of 1600, do not relish the idea that Wealth can be owned by Nations and States, instead of Individuals, Families, and Corporates. Non-stop Borrowing: Even United States is doing. U.S.A. is the largest Debtor of the World. About belief in Magic Money Trees: These beliefs exist even in NAEURANZ. About Venezuela's reduction to Penury: Corruption of Dictators both when Venezuela was in the Sacred Capitalism of the NAEURANZ type, and the Chavez Socialism type, might have led to hijacking away the Wealth of Venezuela to Tax Havens run by NAEURANZ. Socialism does not lead to penury. Socialism involves sharing of Poverty, which may not be liked by Upper Middle Class and the Wealthy Classes. In Socialism, as long as Dictators do not hijack and transfer their ill-gotten wealth to Tax Haven countries, Wealth is bound to remain in the same country. Then, the question of trickling down the benefits of the Wealth to everybody in the Economy and the Society will take the Lead. Here also, Dictators can cause injustices and hardships to People who do not curry favor the Coteries. ‘Let’s have faith,’ Maduro said in the speech detailing his latest plan. ‘Rest assured that sooner or later, we, in economic matters, will be harvesting victories.’ Thousands of his citizens gave their answer this week by heading for the border: so many that Ecuador has started to demand passports, rather than the identity cards they used to accept. A passport is hard to come by. Such is the corruption that it costs $1,500 in bribes — so only the wealthy can afford to walk over the border. The rest are trapped in a country run by a narco-criminal gang whose cronies have benefited hugely from arbitraging the official and black market exchange rates for more than a decade. They do not care one jot about reducing the people to paupers in the process. It is estimated that two million Venezuelans have become food scavengers. If Maduro tried to create 'self-confidence' in his People, we can welcome it. But at the same time, we have to expect Honesty from not only himself, but also from his Lieutenant Assisting Functionaries such as Finance Minister, Home Minister, Food Minister. The Author of the Spectator Article seems to show false sympathy on the Poor of the Venezuela who could not cross over to Ecuadar or Peru, because they could not purchase Passports by bribing Venezuelan Govt. Officials. Poor leaving their Motherlands to neighborhood countries by crossing over from borders is a Natural Phenomenon. For example, BanglaDesh Poor are crossing over to Assam and other North Eastern States in India, as if Assam and NE States of India are Eden Gardens. They are just Crossover from one "Condition of Poverty" to another "Condition of Poverty". There may be minor variances, between the Poverty Levels of NE Indians and the Bangla Deshi Citizens. But by and large, a Migration will not give a Great Economic Uplift. Before we go to further analyses of more quotes, here are more views of ybrao-a-donkey:-- Mr. Jason Mitchell, the Author of the above Article has to explain why U.K. gives shelter only to Economic Offenders and Serious Economic Offence Fugitives like Mr. Vijay Mallya. Why UK wants and encourages Global Economic Offenders of Poor Countries to purchase Properties in Central London? Why British Administrators and Courts are interested in the Human Rights of Economic Offenders and Dictators, while ignoring the damage they caused/are causing/will cause to several countries of the World? For years, Venezuela has been one giant economic laboratory, its 32 million citizens reduced to guinea pigs. The Maduro regime has been condemned worldwide (except by Jeremy Corbyn, who rang Maduro to congratulate him on his election victory and refuses to denounce him). 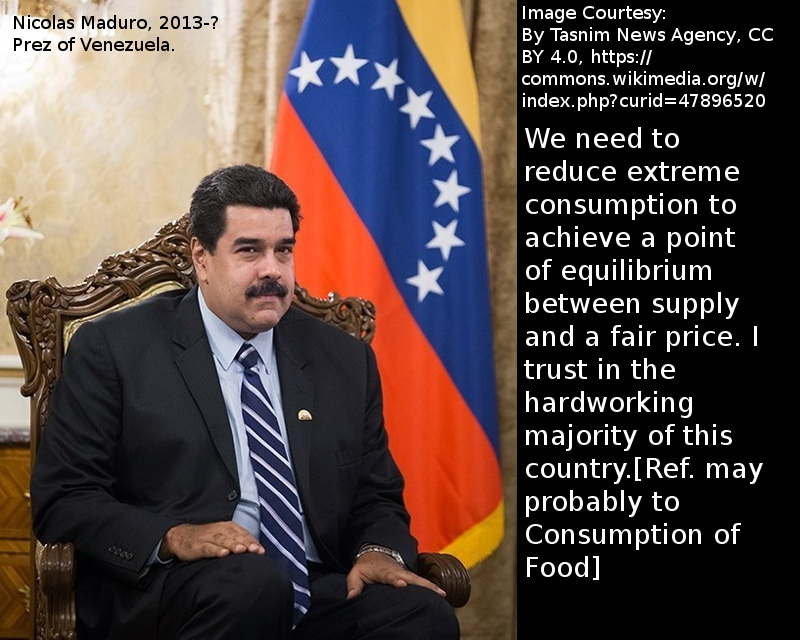 Maduro’s latest experiment is telling, and may well lead to greater economic catastrophe and even massive famine. I am not sure, whether Mr. Jeremy Corbyn is aware of the Mal-Administration by Dictators and their Coteries in Communist and Socialist Countries. Had he been aware, he might not have congratulated Mr. Maduro. There is a need for Socialist/Marxist Writers and Leaders whether they belong to Ruling Parties or to the Opposition Parties, to be alert and wary, about Dictatorships and Tyrants. Incomplete. I am going to complete shortly. $010 Is John Kerry a salesman for IMF? John Kerry is the new 2013 Secretary of State representing United States. He has embarked upon an ambitious tour of eleven countries on his very first assignment. He is in Egypt now. IMF is a short-term money-lending institution. Loans given by it, definitely are short-term. They carry nearly commercial-market-rate of interest. IMF is notorious for its arm-twisting and strings. The new Egyptian rulers have agreed in principle to swallow this bitter-pill. Probably, they may want some sugar-coating, before they open their mouths. Labels: $010 Is John Kerry a salesman for IMF? #009 Why select only Mugabe? Africa , sadly, is a continent of deprivation-and-poverty. Who caused this poverty? May be African-peoples-themselves. May be African-rulers. May be the Euro-American colonisers. BBC-UK has shouted at the top of its voice: ``Zimbabwe's Mugabe holds lavish 89th birthday party``. Cost-of-celebrations:: $600,000. Craze: Minting-gold-coins on the occasion. ybrao-a-donkey`s comments: True, that African-Heads-of-State should exercise some restraints in expenses and luxuries, if they have to save their peoples from hunger-and-poverty. But, why BBC and Britain are crying hoarse? European past-colonial-rulers and present-MNCs-monsters have their role in impoverishing Africa. Their ire against is because he is not allowing them to to knock-away-bulk of the cake. Somehow, Euro-America is unable to work-out an acceptable arrangement of exploitation as they have done in Saudi Arabia. Mugabe is not sufficiently accommodative to them. What are the forebodings? Euro-America may launch another adventure into Zimbabway, a-la their forays into Libya and Egypt. Doesn't Queen Elizabeth celebrate lavish birthday-and-coronation-ceremonies? Are there no poor in Britain? I do not intend to defend the misdeeds of Zimbabway or highlight British failures. What should provoke thought is the selective-reprobations by the Euro-American Media. Labels: #009 Why select only Mugabe? The sufferings of Africa receive little attention of the world. Though institutions such as I.M.F. and World Bank claim to provide financial help to the Least Developed Countries of Africa, they do not address to the underlying key problems of the African poor countries. Africa was a colony of the Europe and a source of slaves for United States. They look to Africa as a source of minerals and agricultural commodities, for buying at throw-away prices. The corruption of the African Heads of State and the Government add to the exploitation and mess. Exploitation by domestic rulers as well as the former colonialists, the African people are like candles burnt from two ends. Here is a 20 MCQs Objective Type Questions test. Just , click the answer which you consider as the best. Press the 'get score button' when you are done. You can press the 'get score' button any number of times even in the midst of test. Press 'reset' if you want to try afresh. 6.Which country lives on copper exports? 7.Which of the following is not a Mediterranean country? 8.Which of the following is not on Red Sea? 10.Though a former French Colony and is on Atlantic Coast, which country imports one third of its needs from China? News Reports indicate that China is moving away from the poor African countries. We cannot find fault with China if it moves away. We cannot expect countries to be philanthropists. Africa, fortunately, is extremely rich in natural resources, both forests and mines. China seems to crave for more gold. It may not satisfy itself even with dollars or Euros, because it has already accumulated sizeable reserves of both the world's leading currencies. South Africa has these gold and diamond mines and reserves. Hence, China befriends South Africa and supports its candidature for the permanent membership of the Security Council. Poor African countries like Somalia, Ithiopia, Kenya, Tanzania, Mali, Malawi, Senegal, Gambia, etc. do not have gold or dollars or euro reserves to pay for their imports. What attractions will Chinese have in the African impoverished countries? Besides, most African countries have dictatorial regimes. China too has a dictatorial regime, but of a different kind. Chinese dictatorship is like refined villainy. African dictatorships are somewhat coarse and rugged. We should sympathise the poor African countries because they have always been at the receiving end of the dubious world commerce and trade. #006 WHY YEHOVA AND ALLAH ARE SO MERCILESS ON AFRICA? WHY GODS ARE SO MERCILESS ON AFRICA? The East African countries Ithiopia, Kenya, Somalia and Uganda are facing their worst drought today. They do not have rains for the last three years. Drinking water has become extremely scarce, noT to speak of water for irrigation. The countries have become deserts with sand dunes spread everywhere. UNO says that the East African Coast will get rains in a few days. Why Gods are so merciless against the guiltless poor Africans? Why the Christian God Yehova, the Islamic God Allah, and the numerous other tribal gods do not show a little compassion for the cursed? Why the compassionate Buddha and the 330 million Hindu Gods of the Orient do not bless the Africans? It does not really matter if Gods do not help. Why the wealthy European and North American countries which plunder the African natural resources and dump the nuclear wastes on Africa, do not help the dark Continent? Why the Belgians pour the milk they produce in the Sea? They could, as well, supply the milk to the poor African Nations, to save the endangered malnourished children. Labels: #006 WHY YEHOVA AND ALLAH ARE SO MERCILESS ON AFRICA? Shri Ramachandra University, Tamil Nadu launched a pan-African E-Network Project to extend continuing medical education and training programs for nurses and para medical staff. They also claim to provide online medical consultation for 79,000 hours, offline advice to five patients per day in each of the 53 African countries. So far, so good. But my small MIND gets a small doubt. Is SRU doing all this with philanthropic purpose? Not. They seem to have an eye to capture some education business and make some bucks from the poor Africa which has already been deprived by the Europe and the US. Why not SRU extend the same service to the remote Primary Health Centres in Tamil Nadu run by the Government of Tamil Nadu? #004 WHY DO INDIAN PRIME MINISTERS ALWAYS VISIT ONLY SOUTH AFRICA AND NIGERIA? INDIAN PRIME MINISTER visits only Nigeria and South Africa. Why does he not visit other countries? Are they so poor that they do not deserve his condescension. Nigeria is adjacent to France, with a little of Mediterranean Sea separating the both. India buys large quantum of arms from France. The Indian PM visits France quite frequently. The visit to Nigeria may be tagged to it. South Africa has large NRI diaspora population. Mahatma Gandhi led some movements there. The Indian PM naturally gets invitations to visit S.A.
India should treat other African countries also on equal footing. Labels: #004 WHY DO INDIAN PRIME MINISTERS ALWAYS VISIT ONLY SOUTH AFRICA AND NIGERIA? News Reports indicate that Sub Saharran countries (Algeria, Djibouti, Egypt, Morocco) have declined to allow their territories for establishing African Command. It is good that the African countries are learning from Imperial History. #003 WHO GAVE ARMS TO SOMALI GUNMEN ? News: Somalian gunmen attacked Ethoiopians and killed an officer. Who gave guns to the Somalian gunmen? For what purpose? Labels: #003 WHO GAVE ARMS TO SOMALI GUNMEN ? #002 HOW LONG SHOULD AFRICA BE A NEGLECTED CONTINENT? Africa continues to be a dark and neglected Continent. Kindly courtesy, the whole world? The African leaders themselves? the EU, US and Canada? Chinese Premier visited Africa, a few months back, hunting for goodwill or markets. Labels: #002 HOW LONG SHOULD AFRICA BE A NEGLECTED CONTINENT?